My inclusion of the words, “individual”, and “cobbler” in this title is probably controversial. This is a large portion (the dish is 500 ml, about 16 oz) as my husband loves fruit desserts. Also I know that most people would not call this a cobbler but for some reason we do. I am not sure why. 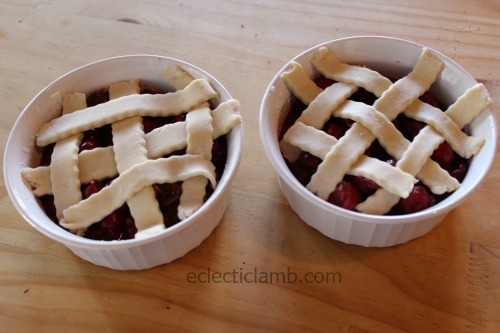 This fruit dessert has a top lattice of pie crust and no bottom crust. I often make this easy fruit dessert for my husband. I say often but he would probably say not often enough. I was a little surprised that this is the first time for it to appear on my blog but it is so ordinary to me. I make them with whatever fruit I happen to have in my freezer (usually peaches or sour cherries). My husband loves sour cherries and we sometimes go pick them ourselves even thought it is quite a drive from our house. I have never tried this dessert as I don’t like cherry desserts – the slim chance that I may get a pit deters me (we use the automatic depitting machine at the cherry farm), also fruity desserts are not my thing. I don’t think that it is very sweet as my husband prefers dessert to not be extremely sweet. He will eat sour cherries right off the tree! I don’t really have a recipe for these. 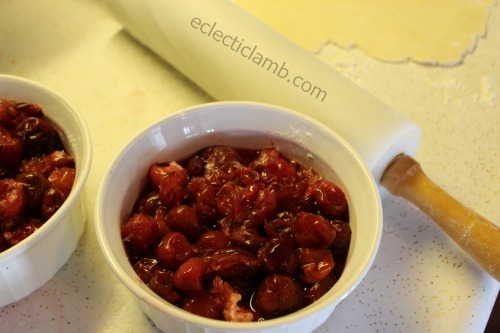 I thaw frozen cherries, drain a majority of the juice and fill up my containers (the dish is 500 ml, about 16 oz). I usually make two at a time. One he eats for dessert and the second one either for breakfast or dessert the following night. I add 1 Tbs of cornstarch and 1 Tbs of sugar to each dish. 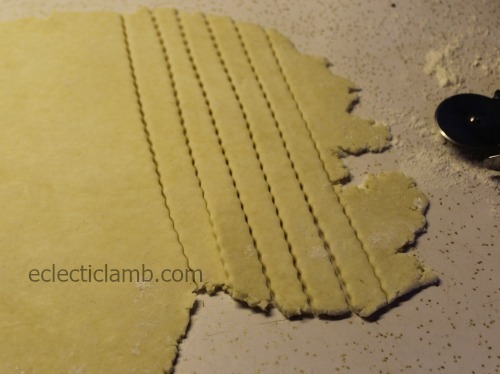 I make this pie crust but you can buy pie crust to keep it easier of you want. The photo is a little deceiving. My cutter has two types, curved and straight. Only the straight cut is shown in the photo but I used the curved to cut the crust. Here are my Sour Cherry Cobblers before baking. I bake them at 375 degrees for about 40 minutes (until the filling is bubbly and pie crust lightly browned). My niece also likes these but since my husband loves these he usually does not want to share. But sometimes I make these on a night she joins us for dinner. 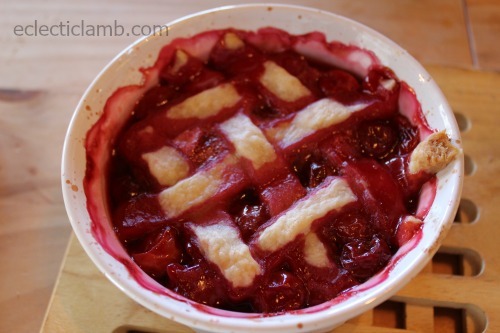 Your recipe is very similar to our cherry pie recipe which both of us love. We were excited to find sour cherries at the Perry Farm Market last summer. We had to hand pit them but the work was worth it. We have some in our freezer and after reading this and seeing your pretty desserts I am craving a slice of sour cherry pie!